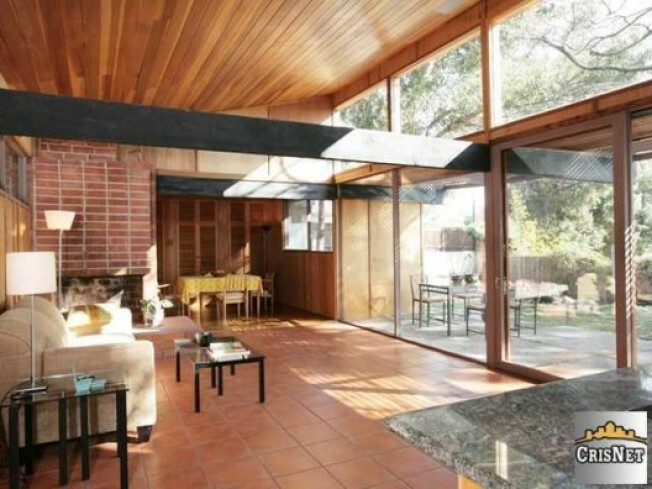 You'll have to move to Tujunga to live in this mid-century modern post-and-beam, recently listed at $549,000. According to the listing, the home was built by local developer Victor Sease, and based on plans "presumed to be" by architects Eugene Weston and Douglas Byles. "Private and gated, the spacious home features 3 bedrooms and 2 bathrooms within an open and flexible floor plan. The U-shaped structure forms an exterior courtyard perfect for alfresco dining. Architectural details include wood clad walls and a vaulted ceiling; an abundance of windows and doors, frame and provide access to the spacious grounds. Updates include granite countertops and large center island in kitchen and spa tub in master bath." And bonus! According to the listing, the original owner was Lew Keller, who directed episodes of the Rocky and Bullwinkle TV series.